This release adds a new Burp Collaborator client for use in manual testing, some new APIs for using Burp Collaborator capabilities within Burp extensions, and a new Burp extension that demonstrates usage of the APIs. 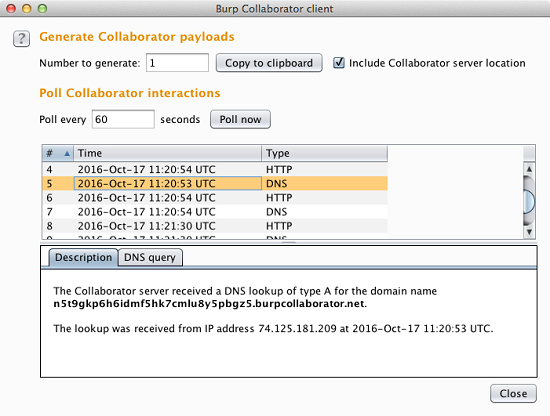 This creates an IBurpCollaboratorClientContext object that can be used to generate Burp Collaborator payloads and poll the Collaborator server for any network interactions that result from using those payloads. To demonstrate usage of the new APIs, we have today released to the BApp Store a new extension that can detect the HTTPoxy vulnerability via Burp Collaborator. The source code to the HTTPoxy Scanner extension is available here.